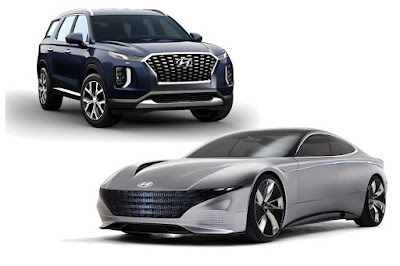 Hyundai Motor Company has been recognized for its cutting-edge vehicle design at the world-renowned iF Design Award 2019 for the fifth straight year. The Palisade and Le Fil Rouge concept vehicle each won the Automobiles/Vehicles category at the eminent competition in the global automotive industry. Hyundai’s record streak this year marks another milestone for the company, which continues to make strides in making premium cars affordable and available for customers worldwide. The award acknowledged Hyundai’s new flagship SUV, Palisade—a premium three-row sports utility vehicle debuted at the Los Angeles Auto Show last year. Another winner went to Hyundai’s Le Fil Rouge concept car, debuted at the Geneva Motor Show 2018. The vehicle embodies a reinterpretation of Hyundai's sporty design spirit that was first featured in the 1974 Hyundai Coupe Concept. Exemplifying “sensuous sportiness,” the vehicle harmonizes the four fundamental design elements of proportion, architecture, styling and technology, and simultaneously combines beauty and function. For more than 64 years, the iF Design Award has been recognized as a symbol of excellence by design professionals around the world. Organized by iF International Forum Design GmbH in Hanover, the world’s oldest independent design institution, the prestigious prize is bestowed upon top designers spanning various disciplines and categories. In 2019, companies from 50 countries participated in the event with 6,400 product submissions, which were judged by a jury of 67 international design experts. Past Hyundai iF Design Award recipients include the Santa Fe, Kona, Tucson, and Elantra.